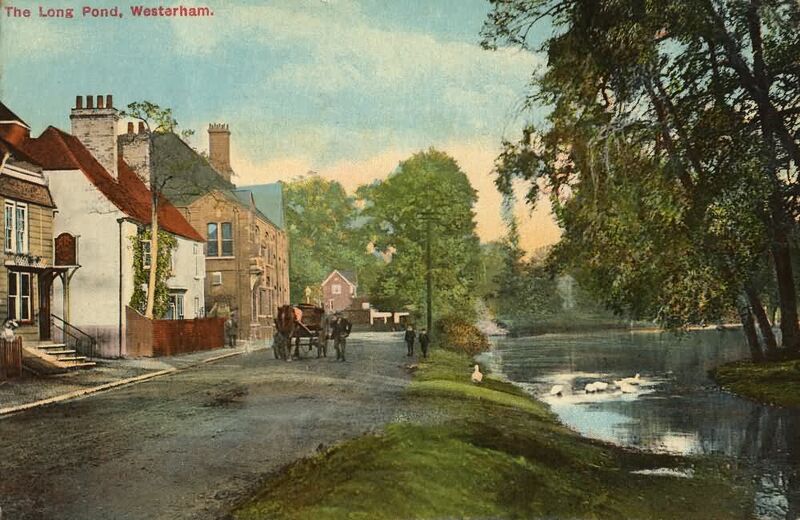 The River Darent rises in Westerham and flows into the Thames at Dartford (maybe once known as Darentford). It passes through Brasted, Sundridge, Chipstead and on into the villages of Otford, Shoreham, Eynsford, Lullingstone, Farningham, Sutton-at-Hone and Horton Kirby. Beyond Otford the river is a groundwater-fed chalk stream which creates an unusually diverse habitat for wildlife and vegetation. There are a number of excellent fishing lakes in these stretches. Over the years the Darent has suffered from over-abstraction and on a number of occasions in the 1980’s sections downstream virtually dried up. 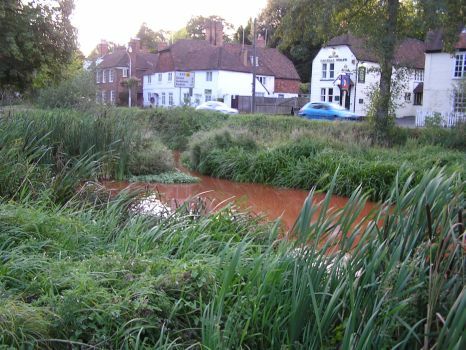 The Darent River Preservation Society (DRiPS) worked hard to negotiate a new deal for the river with the water authorities and the Environment Agency. 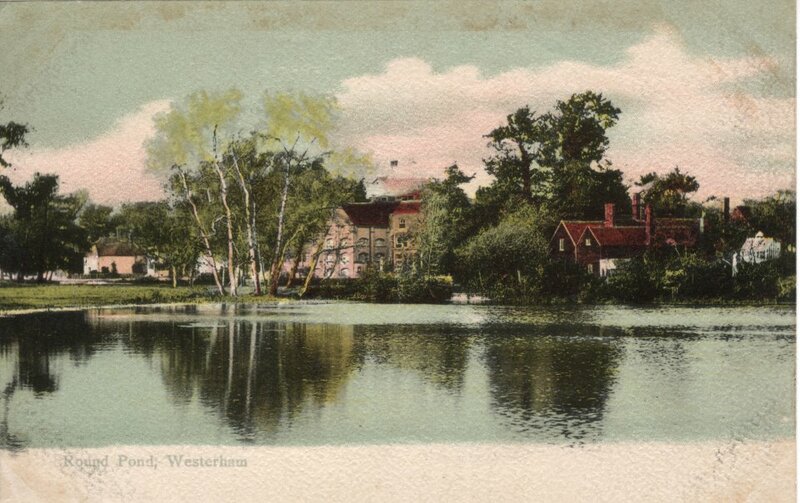 In 2000, Westerham Parish Council took a lease on the Long Pond from Squerryes as a millennium project and the pond was restored to some of its former glory. Unfortunately, rivers never stay the same for long and new sand and silt arrive every year laden with nutrients washed off the fields. In January 2005, the Long Pond needed major desilting for a second time. But the seasons come and go. 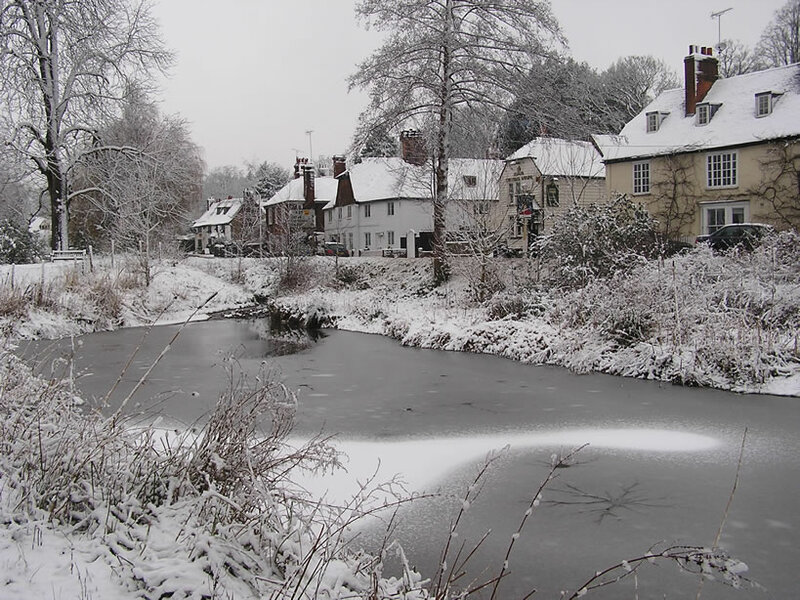 Here is the pond frozen over in the winter of 2006/7 after it had been desilted the previous year. 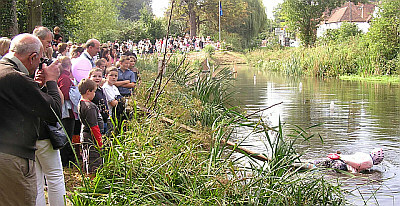 In 2007, the local RNLI group held a fair on the Long Pond to raise money for lifeboats and reenacted the ducking of Hannah Saxby, who was said to have been ducked in the pond in the 1600’s for being a scold. Now in 2015, both the Long Pond and the Round Pond have accumulated more sand and silt, most of it washed down the river, some of it just leaf litter from trees and bushes and reeds around the ponds. An OS map from the 1960s shows the Long Pond and the Round Pond as they used to be – much larger than today. Each cycle of restoration seems to make the ponds smaller. Here are some classic old pictures of the two ponds. 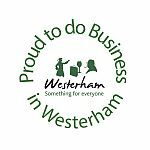 Westerham used to have three watermills. 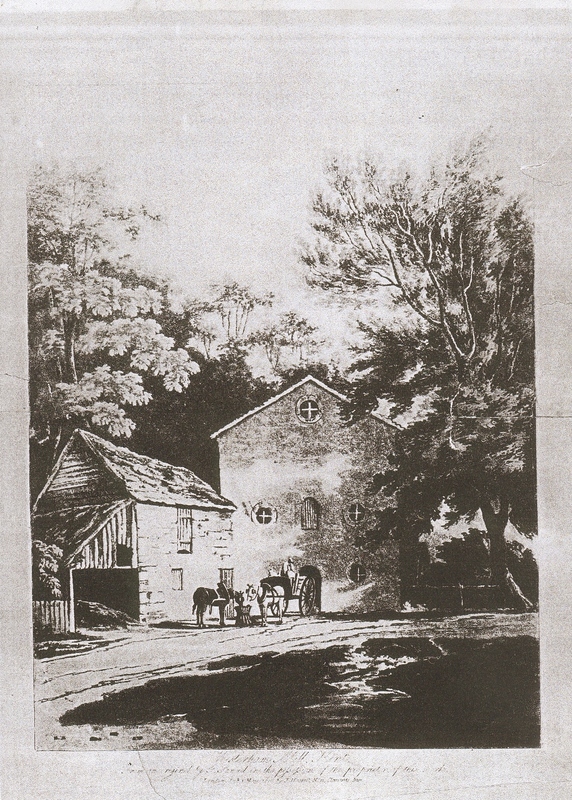 This is a picture from 1818 of Squerryes Mill (also known as Lower Mill) at the end of Mill Lane. 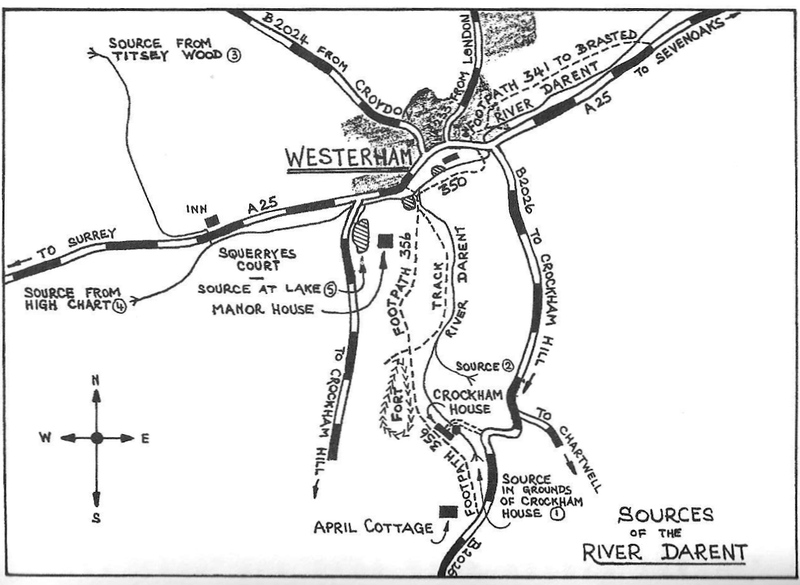 As you would expect, there is no single source for the Darent, but this map from a book on the Darent, now out of print, gives you some ideas of opportunities for exploring upstream.